The Soberanes Fire remained active today, burning hot all the way from Cold Springs, on the Coast Ridge, across to Rattlesnake Creek, north of Uncle Sam Mountain. Light red squares indicate detections acquired around noon, dark red squares indicate detections acquired around 2:00 pm this afternoon. Firing operations were indeed underway between Timber Top and Cold Springs today. As you’ve no doubt noticed, the 2:00 pm satellite recorded heat on the wrong side of the line in a couple of places. This might or might not be an error. 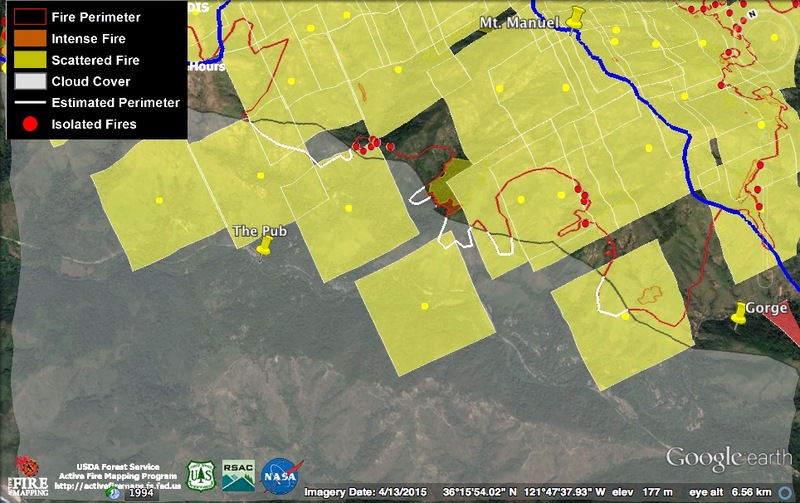 This morning’s Fire Behavior Forecast actually warned that “spots over the line should be expected” in this area, but reassuringly stated that they “should be picked up easily in the light fuels.” There are indeed a lot of open fields in this area, but also sections of brush and timber. If there was fire over the line this afternoon, it was probably near the upper end of the margin of error (at the top of the squares). If fire had actually approached the inhabited portion of Partington Ridge we probably would have heard about it by now. The fire remained very hot along the Carmel River in the Hiding Camp/Buckskin Flats corridor, and appears to have spread into Ventana Mesa Creek, below the Ventana Double Cone, as well. It is once again, incredibly, burning the seemingly inexhaustible fuel supply near the summit of Uncle Sam Mountain. But there remains no sign of fire crossing the Carmel River – yet. The Chimney Fire stayed hot as well, continuing to burn actively on its southern and western flanks. It is listed at 11,233 acres and 33% containment this evening. The official numbers for the Soberanes Fire have not been updated this evening. Outside the fog zone, things really warmed up on the Soberanes Fire last night. The outlying orange heat detection, which didn’t make it onto last night’s maps, is from 3:30 pm yesterday afternoon. The red heat detections are from around 11:00 pm last night and 3:00 am this morning. 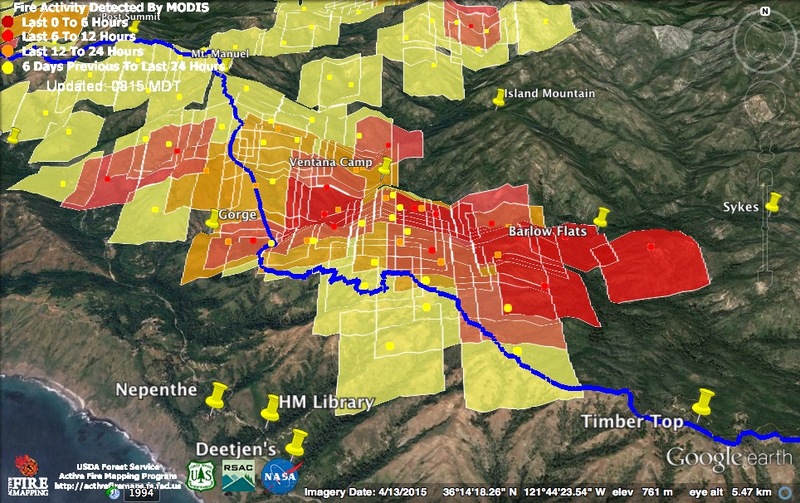 At the south end of the fire, things were hot on Timber Top and throughout the Logwood Creek drainage. The fire appears to have made a strong run along the high ridge from Mt. Olmstead toward Cold Springs. The satellites provide no evidence of any firing operation along the section of the Coast Ridge between Timber Top and Cold Springs, but last night’s infrared map (from around 11:30 pm) shows what appears to be the start of firing moving south from Timber Top. Hopefully, they have gotten, or will get, the line fired to Cold Springs and beyond before the main fire (which appears to be getting pretty close) arrives. 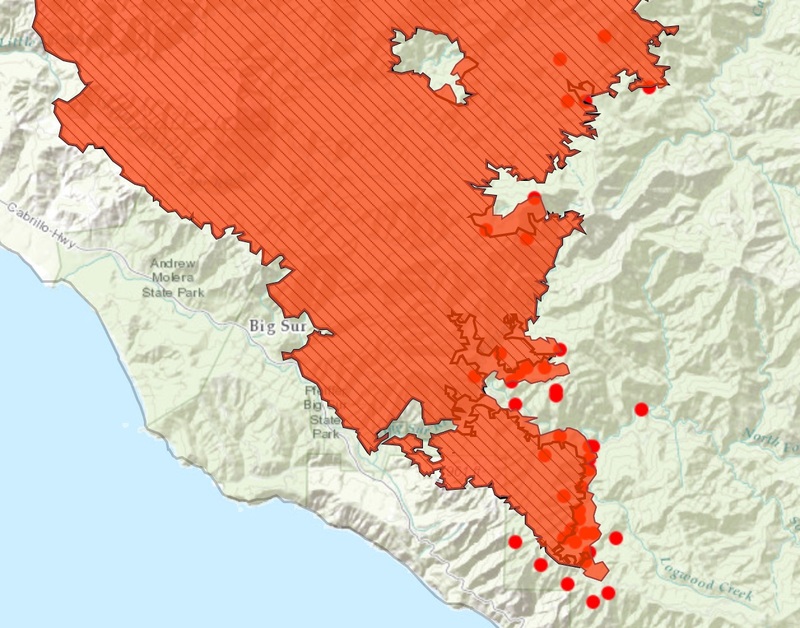 Pretty much everything from Ventana Creek to Lion Creek and from the Ventana Double Cone to the Big Sur River appears to have been on fire last night. While there’s no way to tell whether the outlying orange square, from around 3:30 yesterday afternoon, is accurate or not, it really doesn’t matter. The fire will be there soon enough. At the north end of the fire, there was renewed burning in Rattlesnake Creek and on slopes to the west of the Carmel River. There is still no evidence of fire crossing the Carmel River, but it is now burning quite close to the river, and quite actively, in the Hiding Camp area and for quite a ways downstream. If/when it crosses the river in this area, it will have an easy uphill run to Pine Valley, along a dry brushy ridge. Down at the Chimney Fire, orange heat detections from 3:30 pm yesterday, show that the fire was making quite a run to the west at that time. That run appears to have slowed overnight, but there is still plenty of heat in the southern and western portions of the fire. It is listed at 8,300 acres and 30% containment this morning. This morning’s official numbers for the Soberanes Fire: 79,000 acres; 60% contained; 57 homes and 11 outbuildings burned; 3 homes and 2 outbuildings damaged; 1 fatality and 3 injuries. Heat detections acquired around noon today show active burning in three areas. Near the Coast Ridge, fire was burning in Logwood Creek and on Mt. Olmstead. North of the Big Sur River, fire was burning across Island Mountain and into both the Ventana and Lion Creek watersheds. Further to the north, it looks like the fire backing down toward Hiding Camp and the Carmel River got beneath some unburned country and made a strong run back up the hill. 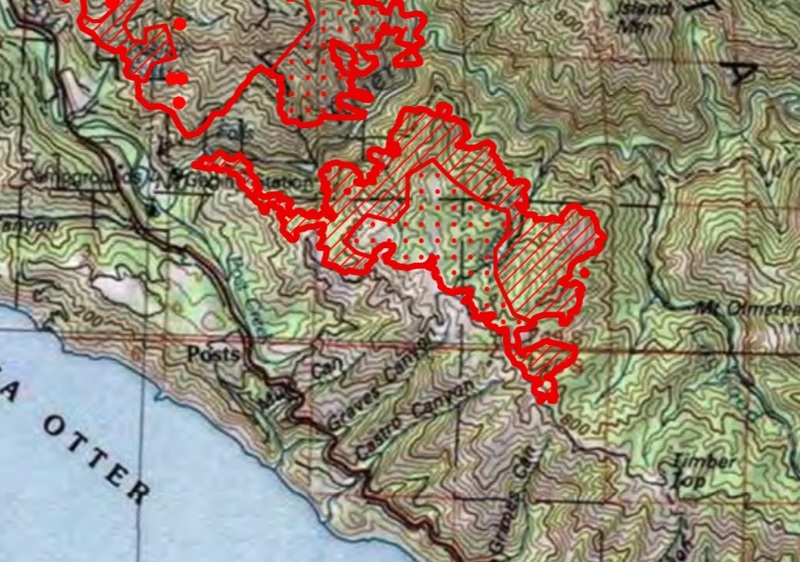 If the fire spots across the Carmel River in this area, it could run uphill to the east and be in Pine Valley, and on its way to Chew’s Ridge, very quickly. The noon satellite found no new heat on the east end of the Chimney Fire, but continued active burning to the south and southwest. It is now listed as 8,000 acres and 25% contained. For comparison, the Blue Cut Fire near Cajon Pass is now reported to have burned 65,000 acres since it ignited yesterday (there are conflicting reports – all from Cal Fire Public Information Officers – on exactly how much it has burned, but all agree it is a lot). If 65,000 acres is anywhere close to correct, that fire will likely burn more in its first 48 hours than the Soberanes Fire has burned in almost a month – more, in fact, than the Soberanes and Chimney Fires combined. And all in an area that, as many firefighters have noted, seems to burn more often than any other in California. As we’ve seen here as well, it’s not time since the last burn that determines the ferocity of fire in a chaparral dominated landscape, it’s temperature, humidity and wind. 7:15 pm Note: Blue Cut Fire acreage has been officially downgraded to a more comprehensible, yet still enormous (for less than two days of burning) 26,000 acres. That’s about as much as the Soberanes Fire burned in its explosive first week. A satellite pass around midnight last night found heat only on Island Mountain and in Logwood Creek. Thanks to the marine layer, the fire is not expected to make any significant advances today, although it continues to smolder above the Carmel River all the way from the Ventana Double Cone to the Los Padres Reservoir. The southern flank of the fire, running from the Big Sur River across Mt. Olmstead and Logwood Creek to Timber Top, will likely continue to creep south, possibly making uphill runs toward the control line on the Coast Ridge. A wind shift is expected to occur this afternoon, bringing light south winds over the fire. This should create good conditions for firing operations on the Coast Ridge (and will likely bring smoke back to the Monterey Peninsula again). The Chimney Fire still looked quite active at midnight. The heat detections suggest it is still expanding to the east, west and south. It is listed at 7,300 acres and 25% contained this morning. The Blue Cut Fire, in Southern California, meanwhile, has burned 30,000 acres in less than 20 hours. This morning’s official numbers for the Soberanes Fire are: 76,683 acres; 60% contained; 57 homes and 11 outbuildings burned; 3 homes and 2 outbuildings damaged; 1 fatality and 3 injuries. The server where I normally get .kml files containing MODIS data hasn’t been updated this evening, so this (in my opinion anyway, is the next best thing). The red dots are heat detections during the last 24 hours (as of about 8:30 pm this evening). Heat appears on top of Uncle Sam Mountain (amazing that there’s anything left to burn up there), near the Puerto Suello Saddle, along Ventana Creek, on Island Mountain, west of Logwood Creek between Timber Top and the Big Sur River, and in a line along the Coast Ridge. Don’t be alarmed that the line of dots along the Coast Ridge is west of the fire line. Even if the margin of error isn’t displayed in this format, it is still there. Those heat detections are probably really all east of the line. If fire was over the line in that area, someone on Partington Ridge would probably have noticed it by now. 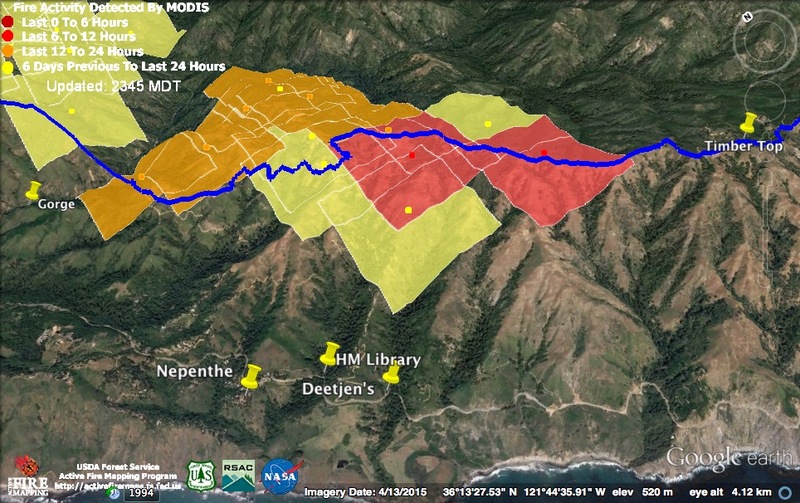 There is also an outlying heat detection along the Big Sur River between Barlow Flats and Sykes (a little downstream of the Lion Creek confluence). 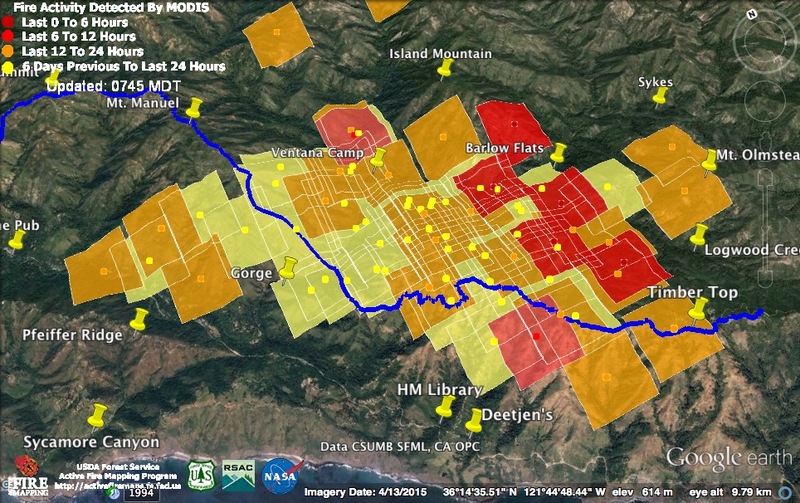 This could well be accurate as fire was detected upslope from there a couple of days ago (older heat detections don’t display in this format) and it could have been backing slowly into the canyon ever since. As the map indicates, efforts to contain the Chimney Fire did not go well today. The latest reports are that there are many spots over the line and that the fire has jumped Chimney Rock Rd. (a little to the south of the southernmost heat detections on this map) forcing firefighters to retreat to safety zones. 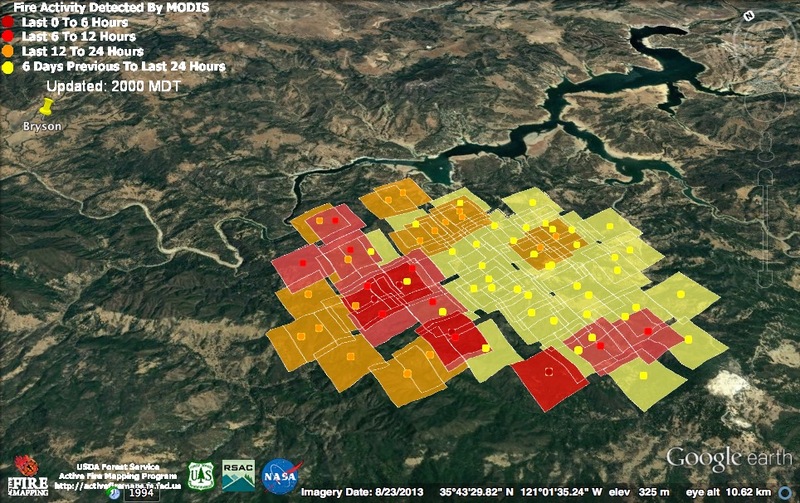 It is reported at 6,900 acres and 20% containment, with 40 structures destroyed and 6 damaged. Firefighting resources are now stretched extremely thin. The Blue Cut Fire, which broke out late this morning near Cajon Pass in Southern California, raced across 15,000 acres in less than 8 hours, burning numerous homes and commercial structures along the way. The extreme threat to life and property posed by that ongoing disaster has necessitated reassigning aircraft and other resources to the south. The fire heated up some during the night, mainly between Island Mountain and Timber Top. New heat detections were acquired around 11:00 pm and 3:00 am. The satellites still haven’t found any heat south of Timber Top, so it is likely that firing operations haven’t progressed much beyond there. 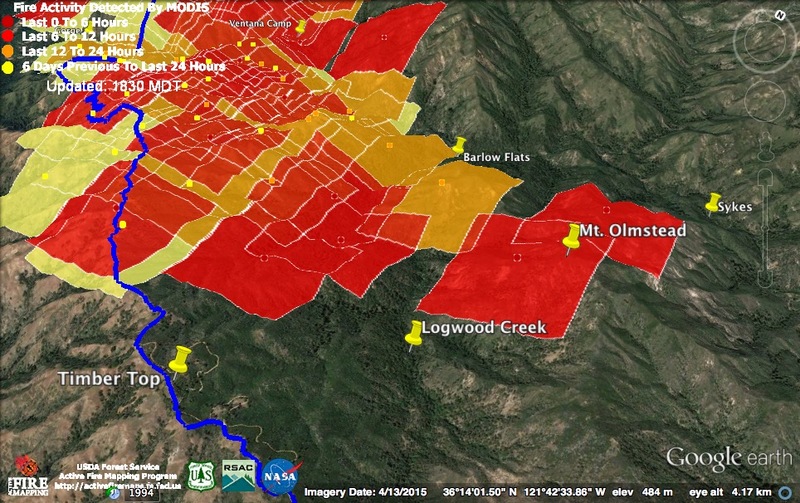 It looks like the most intense burning during the night took place on Island Mountain and along lower Logwood Creek. View of Mt. Manuel from Timber Top (from a 2011 post on the Boronda Trail); a band of fog over the Big Sur Gorge. The firing operations began under the fog and have progressed south along the top of the Coast Ridge to where this picture was taken or a little beyond. This picture was taken only three years after the Basin Complex Fire, but there was clearly more than enough fuel already, including non-native annual grasses and fire-killed trees, to carry fire again. The Chimney Fire also appears to have had an active night – expanding to the east, west and south. It is still a long way from Hearst Castle and even further from Big Sur’s South Coast. Hopefully, it will be stopped long before it reaches either . As of 6:00 am this morning, it was said to be 6,400 acres and 10% contained. This morning’s official numbers for the Soberanes fire: 76,017 acres; 60% contained; 57 homes and 11 outbuildings burned; 3 homes and 2 outbuildings damaged; 1 fatality and 3 injuries. 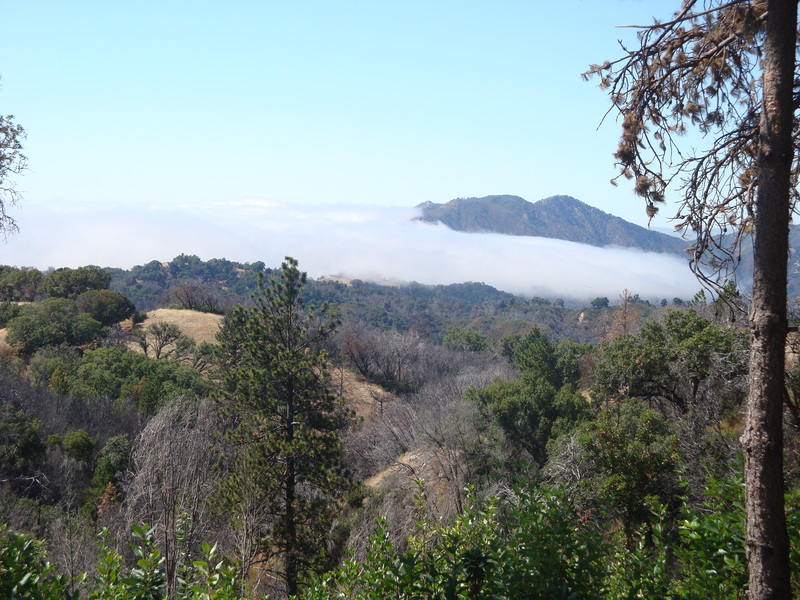 With the deeper marine layer, today was much calmer than yesterday. The fire remained active only at higher elevations. Specifically, around Kandlbinder Peak (on the divide between the Big and Little Sur watersheds), on Island Mountain, and on the Coast Ridge. Firing operations resumed on the Coast Ridge today and are now reported to have progressed as far south as Partington – or approximately to the P in Timber Top. These heat detections were acquired around noon. There was another satellite pass around 1:30, but no heat detections were added for the Soberanes Fire. I have no idea why. Probably some kind of glitch, since the high elevation fires were still going strong at that time (and have continued burning strongly all afternoon). See Big Sur Kate for photos of the smoke from the Coast Ridge firing operations. Until late afternoon, it was also a quieter day on the Chimney Fire, near Lake Nacimiento. 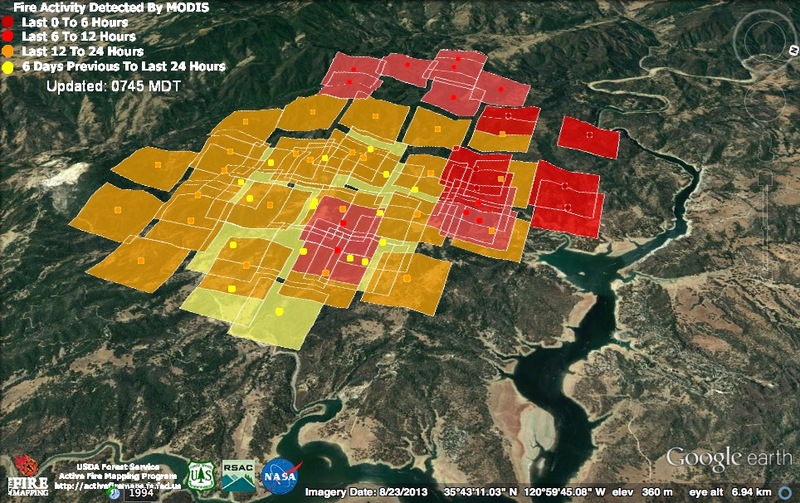 The light red heat detections were acquired around noon, the dark red around 1:30 pm. At the time of the satellite passes, most of the burning had taken place inside the fire’s perimeter. Later in the day, though, a spot fire flared up outside the lines and began creating containment difficulties. The fire has burned more than 5,400 acres and is just 10% contained. The official numbers for the Soberanes fire remain unchanged this evening. The heavy marine layer that arrived last night suppressed active burning over much of the fire. 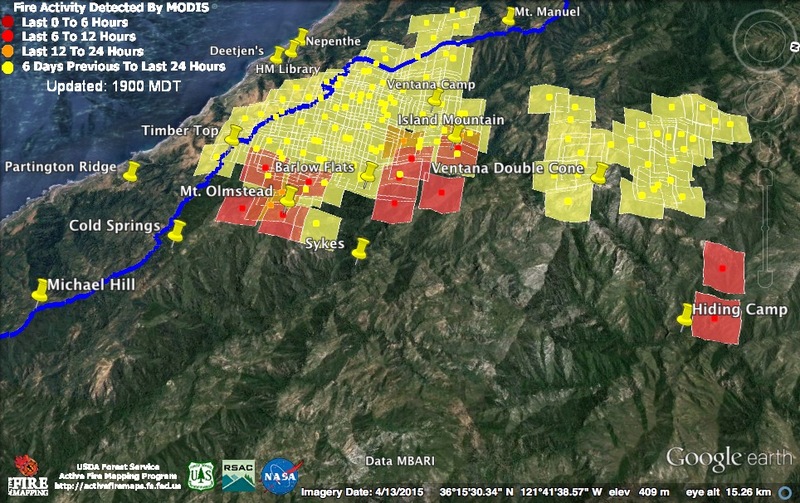 The midnight satellite pass found heat only on the Coast Ridge above Deetjen’s and deep in the Ventana Creek canyon. 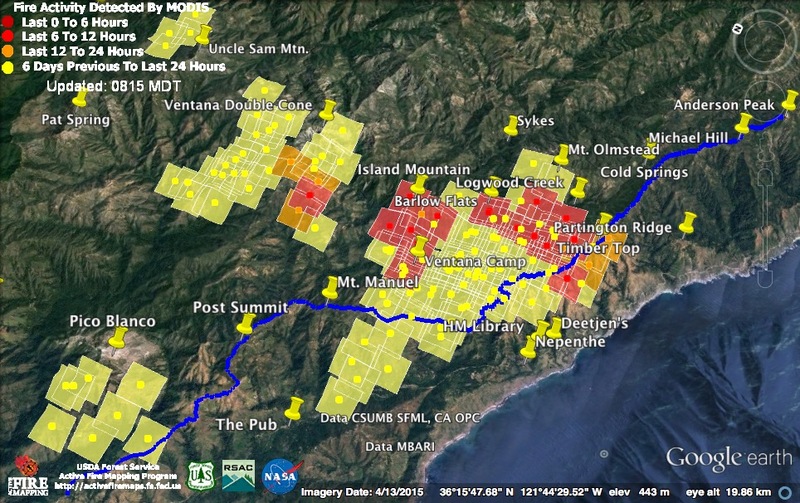 The 2:30 am pass found a large swath of active fire stretching from the slopes of Island Mountain above Barlow Flats, across the Big Sur River and up the ridges to the west of Logwood Creek nearly to Timber Top on the Coast Ridge. Fog is expected to persist near the coast today, but active burning may continue further inland and at higher elevations. 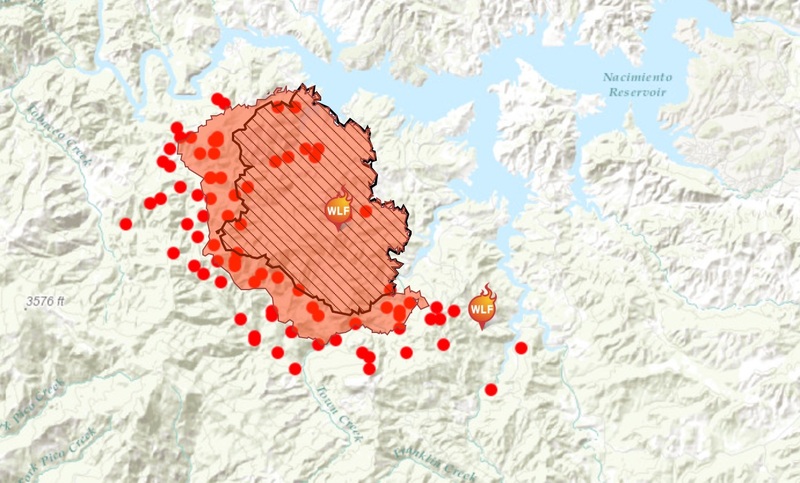 To the south, the Chimney Fire, which destroyed at least 20 structures yesterday, shows significant expansion north toward upper Lake Nacimiento and west toward the higher coastal ridges. The Chimney Fire was listed last night as 4,300 acres and 10% contained. This morning’s official numbers: 74,604 acres; 60% contained; 57 homes and 11 outbuildings burned; 3 homes and 2 outbuildings damaged; 1 fatality and 3 injuries. 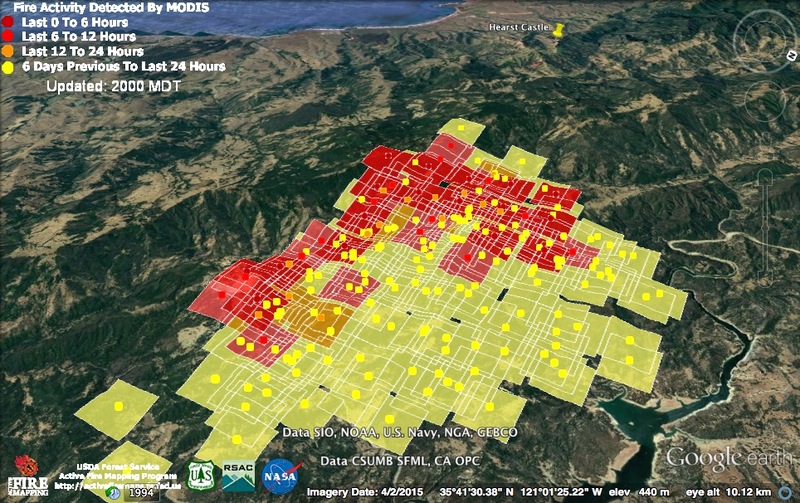 Today was an active day at the southwestern end of the Soberanes Fire and burning has likely only increased since these heat detections were acquired at around 11:00 am and 2:30 pm today. But however difficult things currently are in Big Sur, it is decidedly worse elsewhere. As I write, the Chimney Fire, near Lake Nacimiento, is burning homes and people have been advised to evacuate to the edge of the lake, so they can be rescued by boat. Meanwhile, in Lake County, the Clayton Fire has made a hard run right through the historic town of Lower Lake (well known to us because it serves as the lunch stop on both the Davis and Knoxville Double Centuries) and on into the outskirts of Clear Lake. Multiple homes and commercial structures have already been lost and the fire is still moving forward through an urbanized area. It will be fortunate indeed if there has been no loss of life. The fire behind the Coast Ridge has clearly crossed Logwood Creek and may even have burned over the summit of Mt. Olmstead today. Clearly the firing operations on the Coast Ridge fire break will need to be continued southward soon (if they’re not already underway). 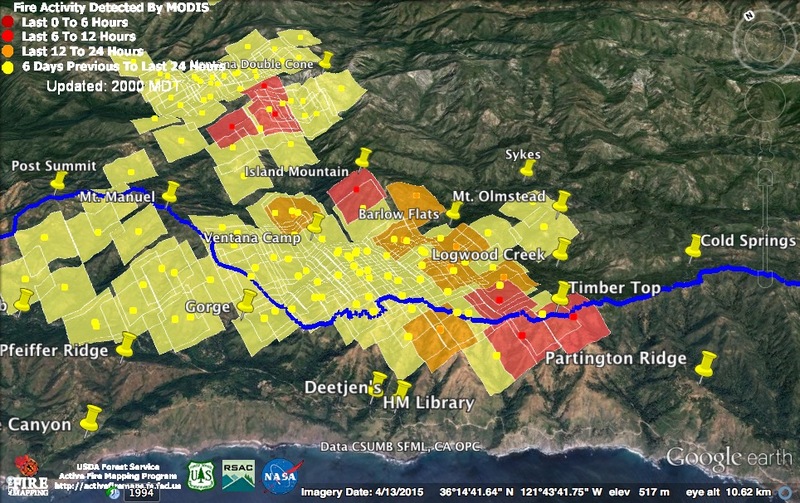 There was a lot of heat showing from the firing operations in the Big Sur Valley this afternoon, especially from the Hopkins Ridge and Pfeiffer Creek areas. The marine layer is supposed to be thicker tonight. We’ll see how much it suppresses active burning by morning. The 2:30 pm satellite pass was too early to catch the big northward push made by the Chimney Fire later in the afternoon. It has now reached the lake in at least one place and has grown to over 4,000 acres. 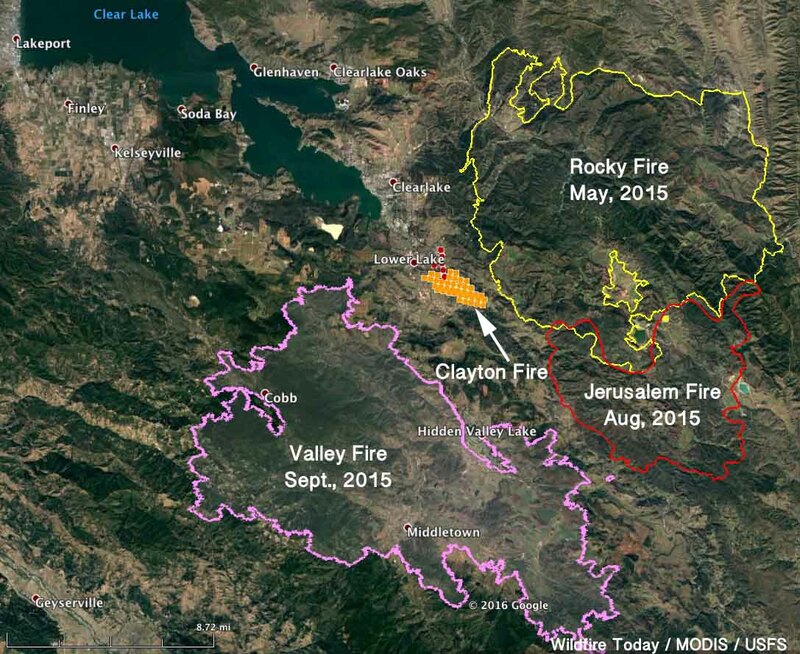 The 2:30 pm satellite pass found the Clayton Fire poised on the outskirts of Lower Lake. It has since overrun the town, with many homes and historic commercial structures destroyed, and is currently burning structures on the outskirts of the city of Clear Lake. 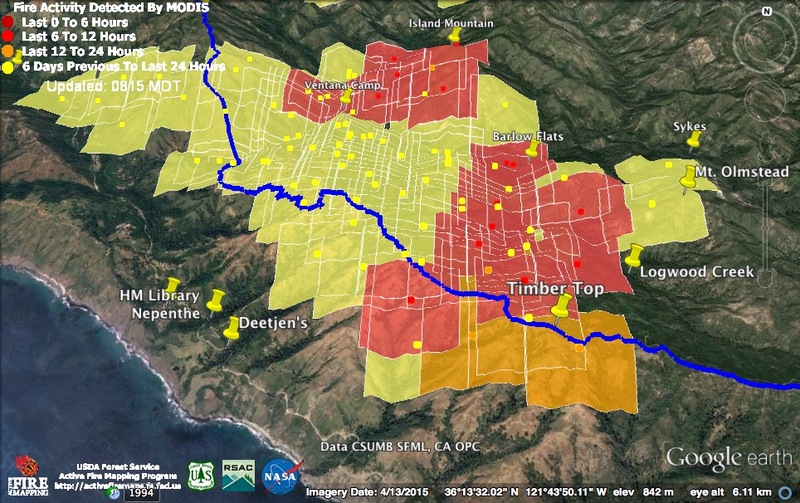 The official numbers for the Soberanes Fire have not yet been updated this evening. The fire continued to be very active on the back side of the Coast Ridge overnight. 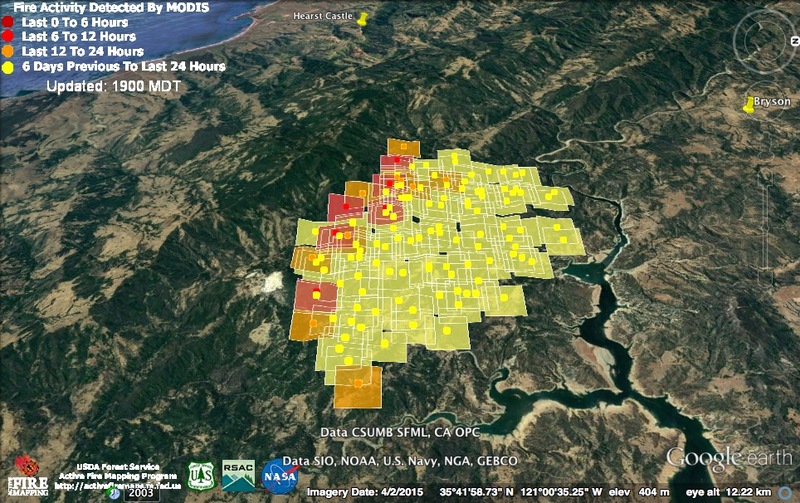 Heat was also detected around the firing operations in the Big Sur Valley, near Pico Blanco, near the Ventana Double Cone, and on Rattlesnake Creek. Heat detections were acquired around 11:30 pm last night (light red squares) and around 3:30 am this morning (dark red). Behind the Coast Ridge, the fire continued spreading to the east. The leading edge of the fire may have crossed Logwood Creek during the night and begun burning the slopes above Barlow Flats. Fire also burned hot in the Gorge overnight and it appears that fire may now be burning along lower Ventana Creek. 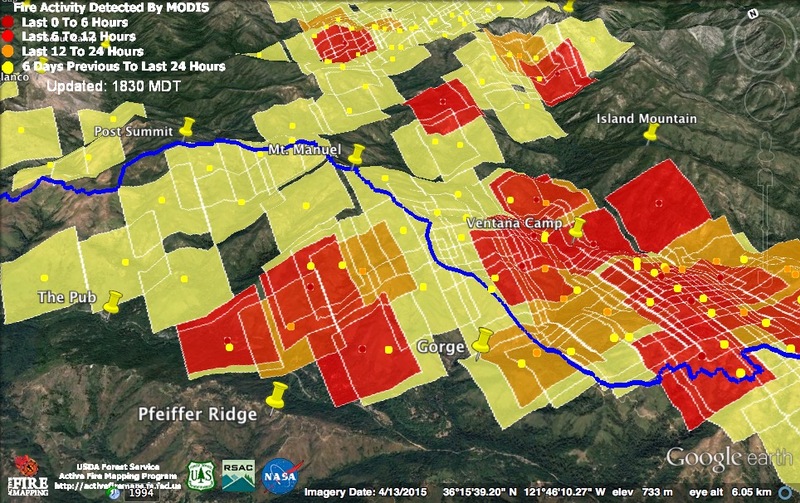 This morning’s infrared map, based on data acquired earlier in the evening (around 10:00 pm last night), does not show fire from the Coast Ridge having reached Logwood Creek. 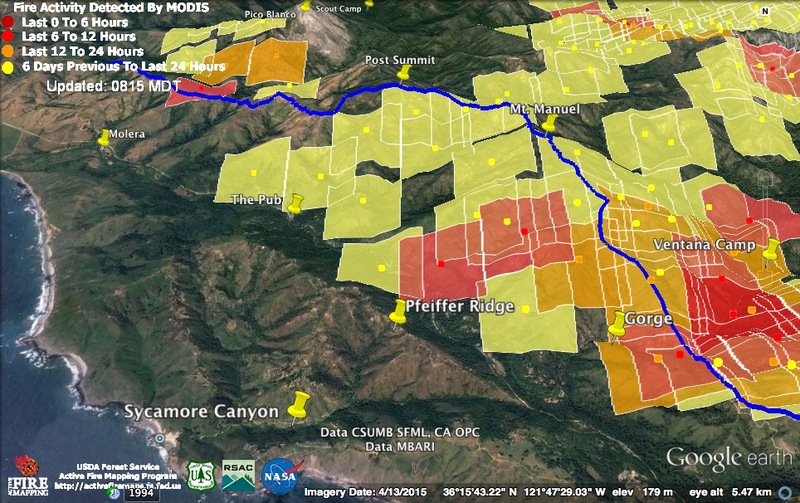 It also depicts a backfire that still remains separate from the main fire and that has not reached the Big Sur River, other than maybe in the Gorge. 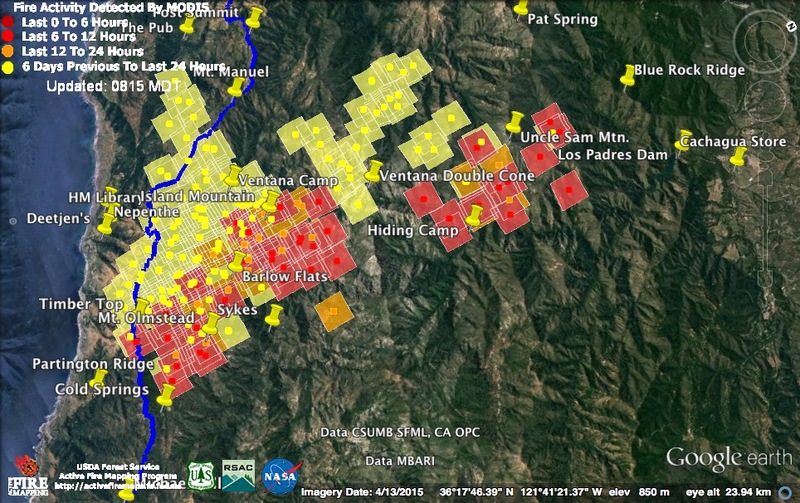 The main fire, on the other hand, appears to have reached the Big Sur River around the Ventana Creek confluence. 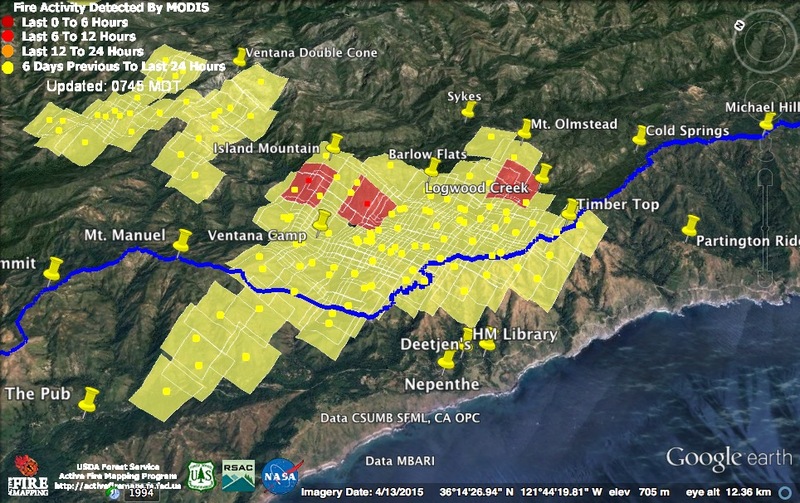 This morning’s Fire Behavior Forecast states definitively that “the main fire has crossed Ventana Creek above the Big Sur confluence.” It warns that upslope runs on the east side of Ventana Creek are to be expected today. 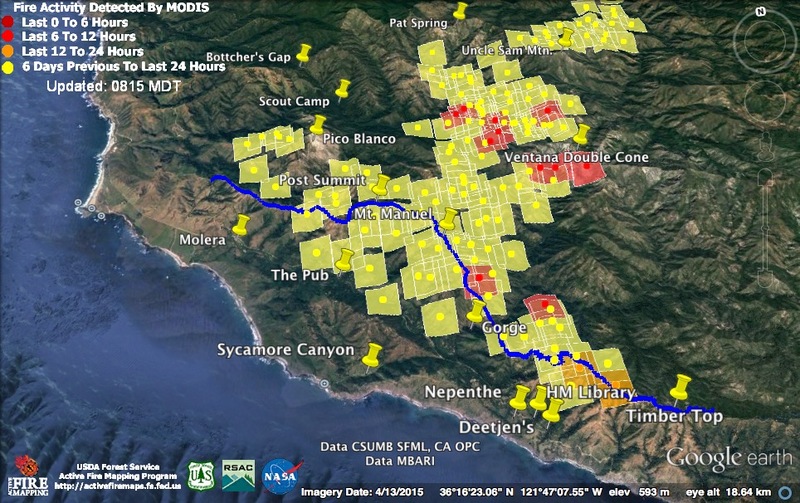 Heat from the firing operations in the Big Sur Valley was picked up in the Pfeiffer Creek area by the 11:30 pm satellite. A 24-hour closure of Highway One through the Big Sur Valley will begin at 2:00 pm this afternoon, as these burn out operations continue. 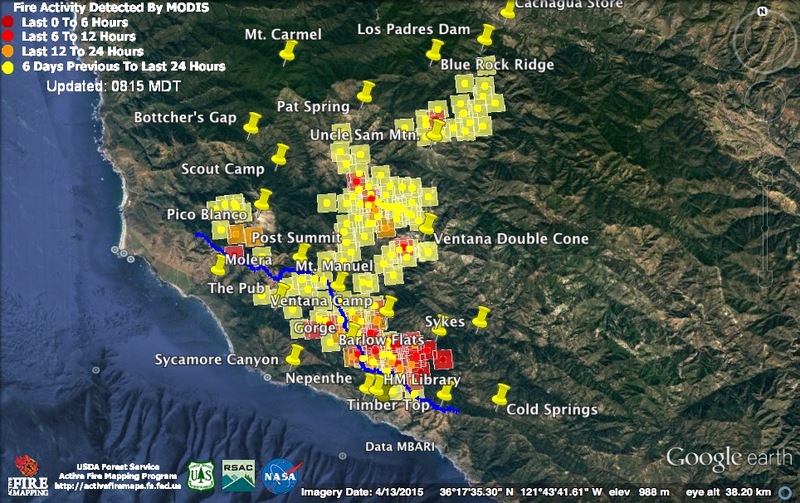 The MODIS satellites found nothing in this area, but check out the small patch of intense heat this morning’s infrared map places on the east side of the Los Padres Reservoir. Looks like the beginning of firing operations along the dozer line that climbs Hennickson’s Ridge to Chews Ridge. 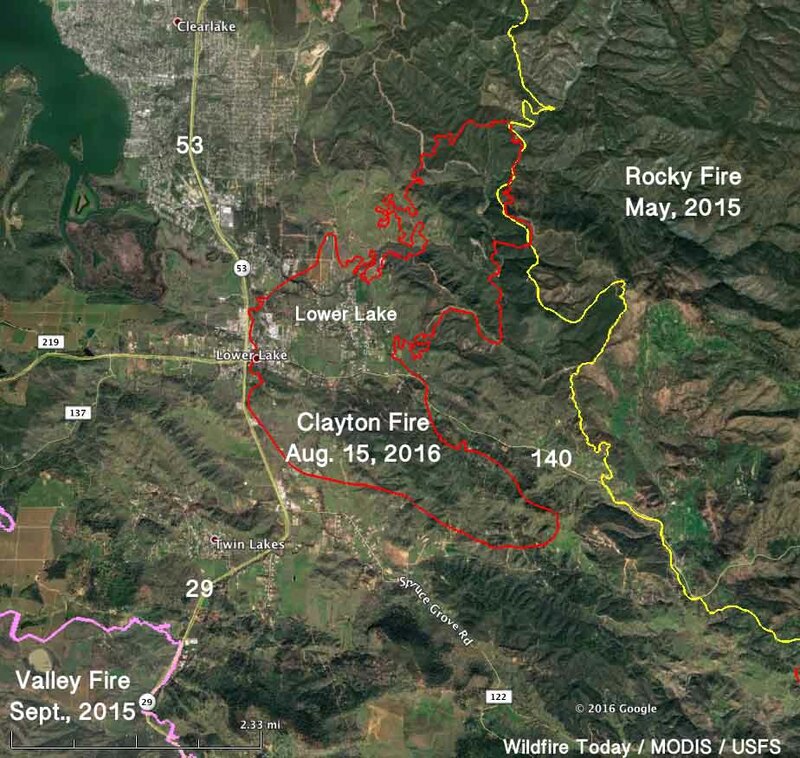 Meanwhile, to the south, a new fire broke out yesterday afternoon near Lake Nacimiento. It’s called the Chimney Fire and it’s reported this morning at 1,250 acres make that 1,450 acres and 10% contained. It’s moving west, in the direction of Hearst Castle. Let’s hope they get it stopped soon. This morning’s official numbers: 72,566 acres; 60% contained; 57 homes and 11 outbuildings burned; 3 homes and 2 outbuildings damaged; 1 fatality and 3 injuries. There was very active fire on the backside of the Coast Ridge and throughout the Big Sur Gorge today. 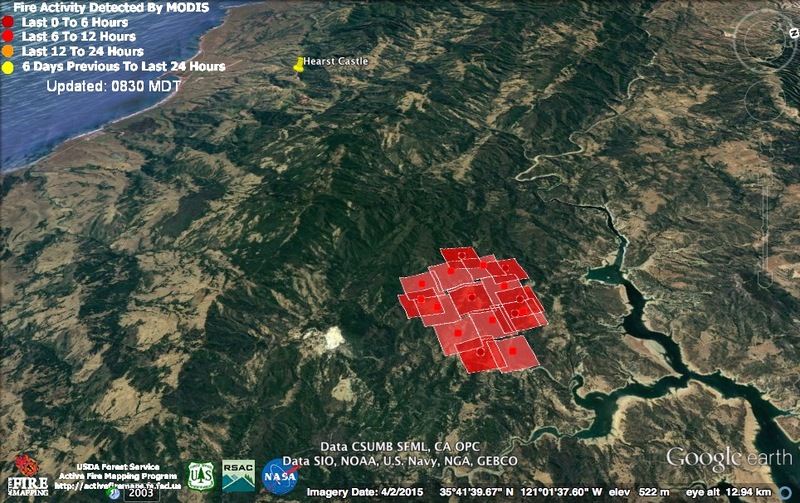 There was also active burning on the southern slopes of Pico Blanco (near Pico Public Camp) and in the usual places near the headwaters of the North Fork Little Sur. Smaller firing operations were also underway in the Big Sur Valley, as firefighters worked to end the threat posed by the fire that continues to creep and smolder along the hillsides to the east of the Highway. 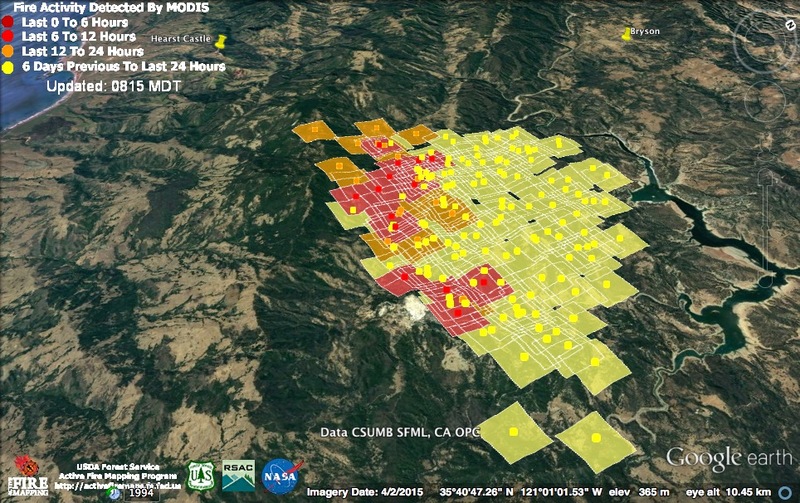 Those operations are said to be going well (See Big Sur Kate for details), but did not produce enough heat to be noticed by the MODIS satellites. Highway One is scheduled to be closed for 24 hours, starting at 2:00 pm tomorrow (Sunday), probably because the firing operations taking place in the Big Sur Valley will be getting closer to the Highway at that time. 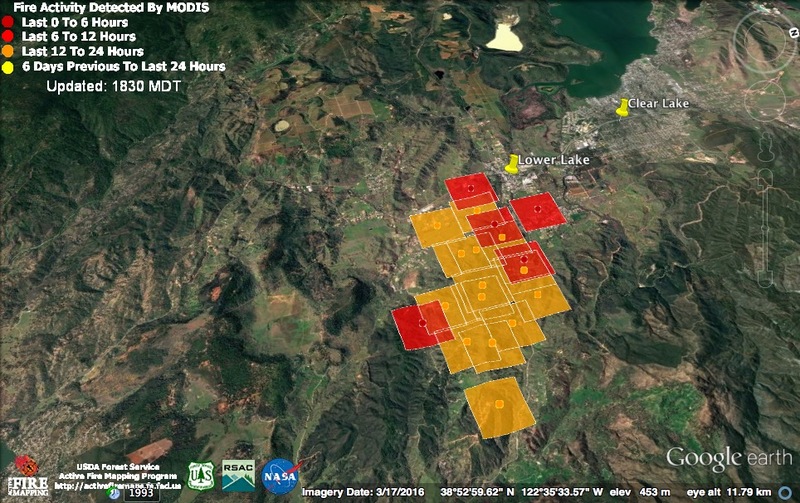 The light red squares represent heat detections acquired around noon today; the dark red squares were acquired around 2:00 pm. Tomorrow and Monday are expected to be a bit cooler with a deepening marine layer, but the marine layer should thin again and temperatures begin to slowly rise by mid-week. The fire resulting from the firing operation on the Coast Ridge was very active today, quite possibly crossing the Big Sur River in the upper Big Sur Gorge and in the vicinity of Ventana Camp. It may well have burned together with the main fire by now. To the east, this fire front is now approaching the confluence of Logwood Creek and the Big Sur River, just downstream from Barlow Flats. The official numbers remain unchanged this evening. The fire got a bit more active last night, especially at higher elevations. With the marine layer expected to compress even more today, that burning may continue or expand. A heavier marine layer is expected to return tomorrow. The new heat detections (red squares) on this morning’s maps were acquired at around 10:30 pm last night and 2:30 am this morning. 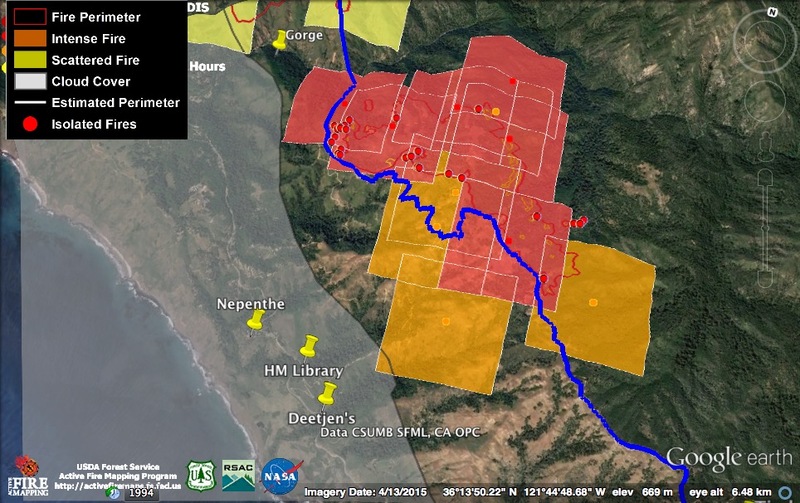 While there were no new heat detections overnight near the fire line on top of the Coast Ridge, the fire started there was actively backing down slope toward Ventana Camp, on the Big Sur River. There was also renewed activity from the main fire on the slopes of Mt. Manuel, just across the Big Sur Gorge. Near the Ventana Double Cone, the fire front that had been smoldering for several days, after making a run into the Big Sur watershed, flared up again in the headwaters of Ventana Creek. The Double Cone’s south face is mostly bare granite and doesn’t offer much fuel, but heavy fuels and high, dry ridges lie just beyond. This morning’s official numbers: 71,860 acres; 60% contained; 57 homes and 11 outbuildings burned; 3 homes and 2 outbuildings damaged; 1 fatality and 3 injuries. In spite of warmer temperatures, the marine layer proved resilient and today ended up being a very quiet day for the fire. 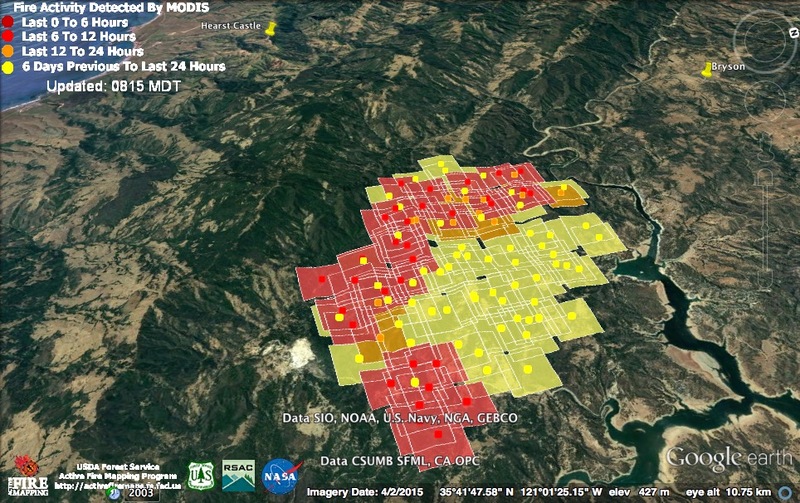 So quiet that the 11:30 am and 3:00 pm satellites failed to detect any heat over the main fire at all. The only fire activity the satellites were able to find was at the scene of the firing operation along the Coast Ridge. The red square on the left was acquired at 11:30 am; the one on the right at 3:00 pm. All indications are that this burn out operation is going as planned. The backfire is burning down toward the Big Sur River on a broad front stretching from Bad Gulch, above the Gorge, all the way around to the ridge beyond Terrace Creek. This evening’s official numbers: 70,615 acres; 60% contained; 57 homes and 11 outbuildings burned; 3 homes and 2 outbuildings damaged; 1 fatality and 3 injuries. The firing operation on the Coast Ridge continued hot overnight. There was also a large flare-up along Dani Ridge, where an island of unburned fuel between the main fire and the firing operations along the Old Coast Rd. burned off. The high elevation fire near the Ventana Double Cone continued active burning as well. The marine layer continued to keep the fire suppressed in other locations, including the Big Sur Valley. I have slightly modified the position of the Coast Ridge fire line (in blue) since my last update to better reflect where I believe it actually is – as opposed to where it has appeared on official maps. Here is a close-up of the Coast Ridge Firing operation with this morning’s infrared perimeter added to the MODIS data. The gray indicates the extent of the marine layer. 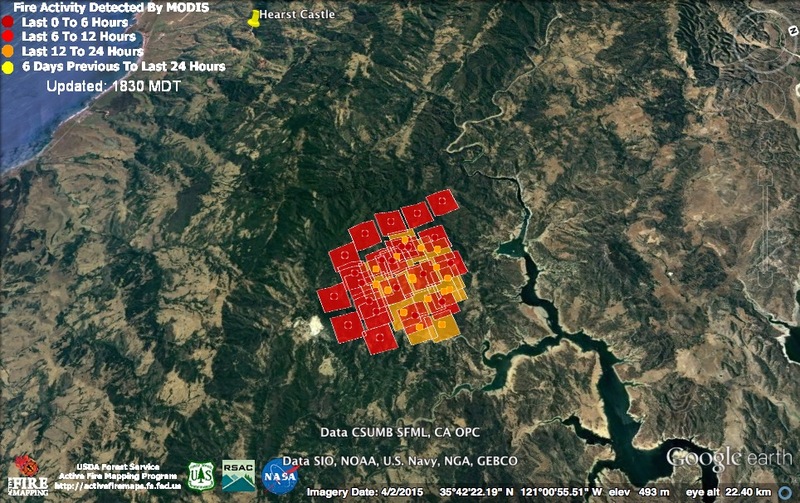 The orange square to the west of the fire line was acquired around 2:00 pm yesterday afternoon, but was, for some reason, not included in last night’s data file. It was probably an error since neither the overnight satellite passes nor the infrared mapping has found any evidence of heat on the wrong side of the line in this area. The red squares were acquired at around 11:30 pm last night and 3:30 am this morning; the newer ones being the furthest from the line, as you’d expect in a firing operation. This morning’s infrared map, showing how fog, in gray, continues to suppress burning in the Big Sur Valley. Above the fog line, some heat clearly remains. This morning’s official numbers: 70,615 acres; 55% contained; 57 homes and 11 outbuildings burned; 3 homes and 2 outbuildings damaged; 1 fatality and 3 injuries. This entry was posted on Friday, August 12th, 2016 at 9:14 am and is filed under Big Sur, Fire, Flood & Apocalypse, Santa Lucias. You can follow any responses to this entry through the RSS 2.0 feed. You can leave a response, or trackback from your own site. THANK YOU once more for the finer details. I am on Tassajara Road, where we are still laying in waiting … will the fire cross the CV river head waters? 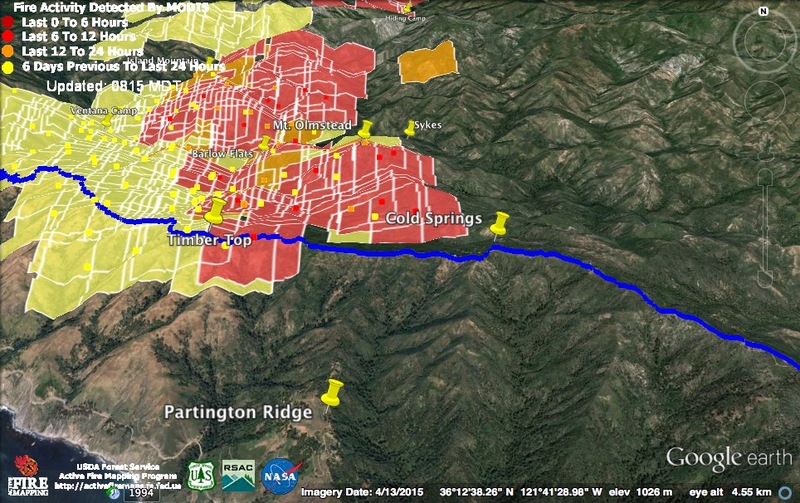 If yes, Hennickson will be the next line of defense and then Laurel Springs, and then Tassajara road … Time will tell where this fire will stop in its track. Weather has been tame so far … could it possibly last for another month? I pray that it does and that All remain safe. Am I leaving a message here for Lucas? 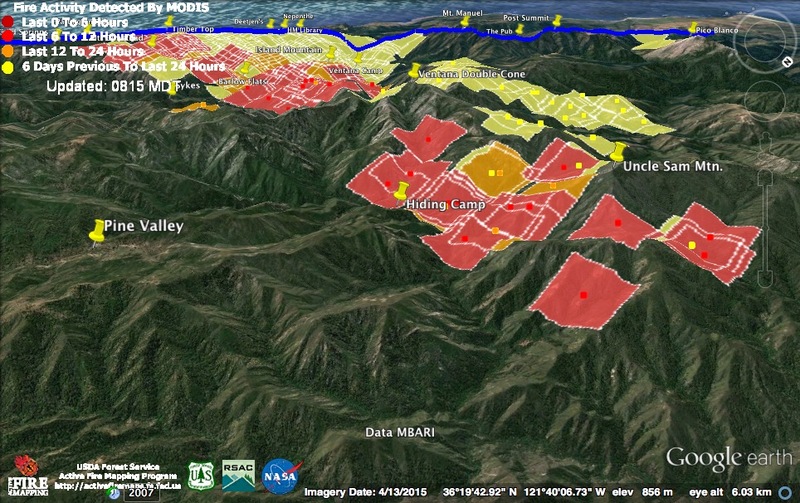 Looking at today’s maps … The Coast Ridge Road firing operations are spotting to the east and south, it appears from the maps. Looks like spots were near Mont Olmsted, way out there. Do you know where they plan on stopping the coast ridge firing ops? Are they just going to let it run all the way east and south? Or is it now getting away from the plan? The answer is that they are indeed planning to let the fire run east and south. 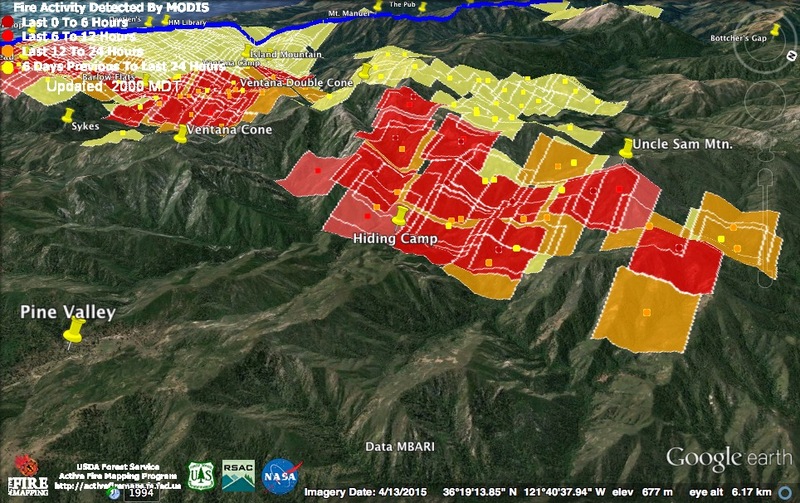 They appear to be planning to try to keep it east of the Coast Ridge, north of the Rodeo Flats fire line (running from the Coast Ridge to near the Indians), and west of the Arroyo Seco/Indians Rd. and the Chews Ridge fire lines. Keith – thank you so much for your informed and most helpful blog. 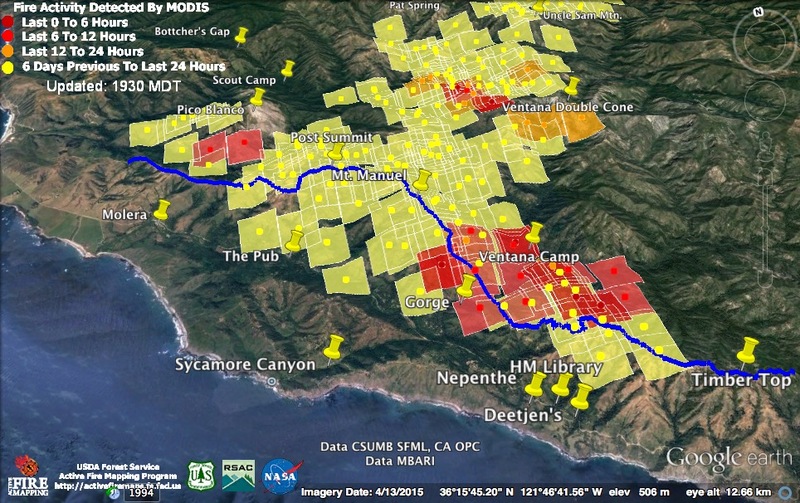 It has been a great source of excellent information during the Soberanes Fire. 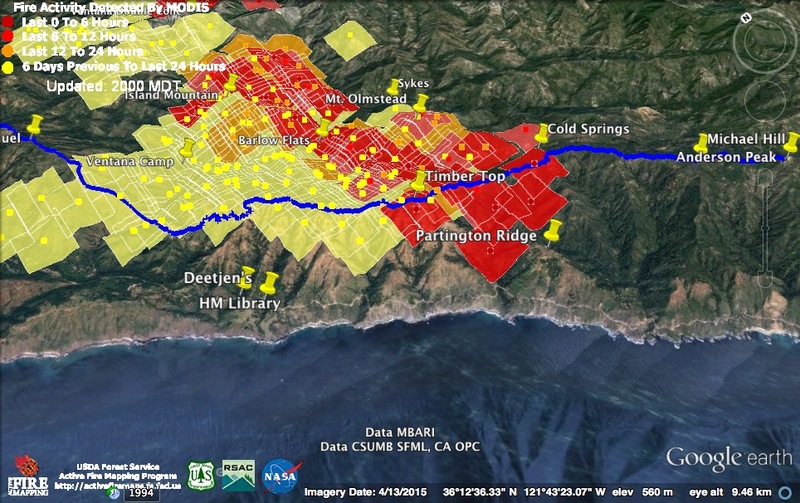 I live in Carmel Valley, and found your blog to be most valuable when the fire was moving toward us. Can you please tell me where one can download the daily “Fire Behavior Report”? BugSurKate has a jpg each day, but it is very hard for me to read when enlarged enough for my less than perfect vision. Thank you again for all that you do. Keith….thanks for the visuals and detailed text. As a Big Sur ex-pat, currently living in N Texas, but with my heart and soul still alive in Big Sur, I am watching with great interest and concern, and availing myself of all resources to track this beast. Thanks for keeping me informed. Appreciate it. 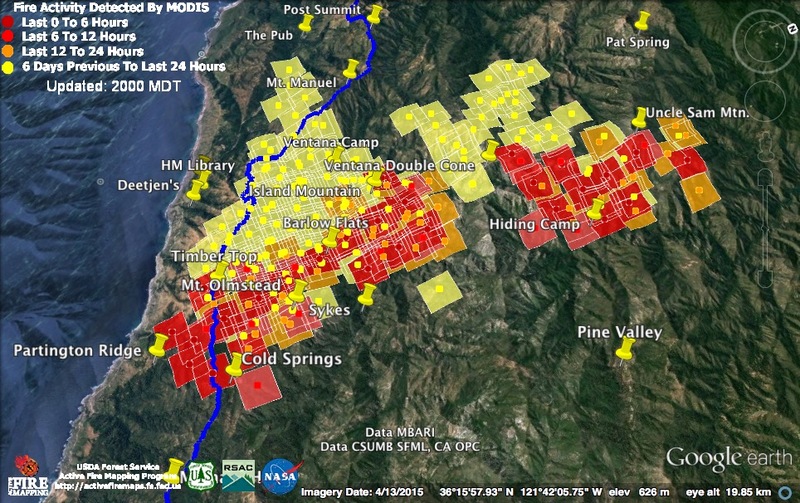 Thank you for posting the IR map of the chimney fire. As the crow flies not that far from my home. 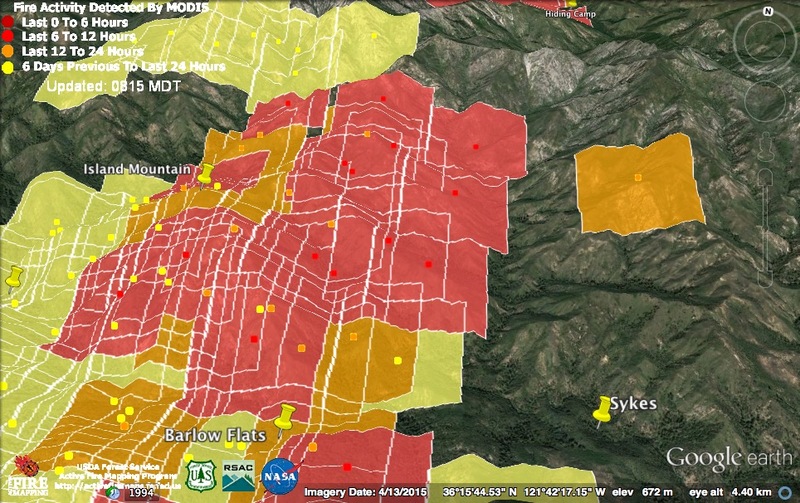 Here is a map of the present Clayton Fire by Bill Gabbert and the historical large fire burns (3 major wildfires) last year 2015. Should be interesting to see how this all plays out with the heavy rains and invasive weed growth from this past season’s El Nino dump in this area. Hi Lucas, Just caught your Aug 14, 9 AM reply to my question. It is extremely upsetting to me that the burn operations on coast ridge road are left to run to East and South. If it is controlled the West, it should be controlled all around. How much more needs to burn needlessly and how much animal (and plant) life needs to suffer and be destroyed, and all this without considering that all of us, humans included, will have to breath in the harmful smoke for several more weeks. Spoke to a friend who is breathing the Chimney Fire. She found deer, lying low on the ground near some ponds, probably suffering from smoke inhalation. There are no medical services for them! This is a man-made fire all around … it should be kept to a minimum at all cost. Letting the back burns run their course in all directions is outRAGEous. Meanwhile, thanks for all the clear and factual info. 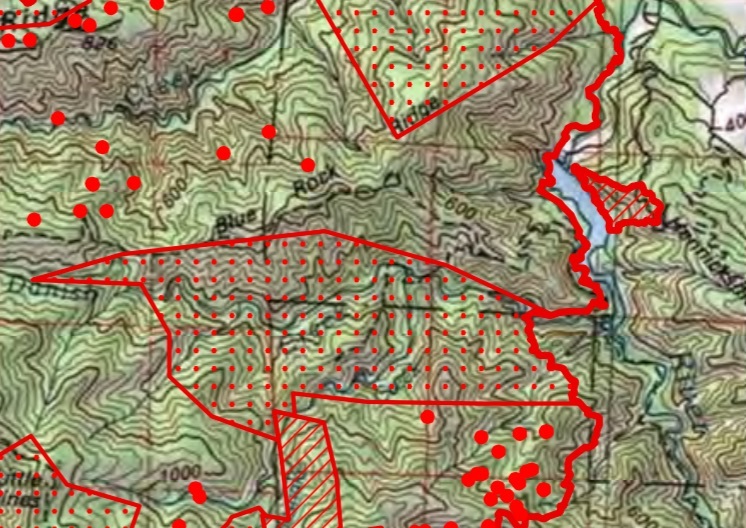 On the Aug 14th IR topo map the Bigfoot icon is in Big Sur, then on the Aug 15th map it is next to Los Padres reservoir. I don’t know what it symbolizes though. I’m with Raj. The air is so polluted, I’m sure it is and will affect everyone’s health. Is it really worth our health and the health of the native animals to suffer when the backburning can be contained? Thank you for your reliable posts. I really appreciate your in-depth analysis of the maps tracking fire progression. Your explanations really help make sense of the information! Scanner traffic tonight indicated that crews were fighting off a run to the east of the Carmel River, probably on the lower slopes of Miller Mountain across from Hiding Camp. First evidence we’ve heard of a crossing of the river. All indications were the suppression effort was successful, at least for tonight. Since cal fire has handed the fire fighting effort over to the Feds, the containment date has now changed to the end of September. ?? 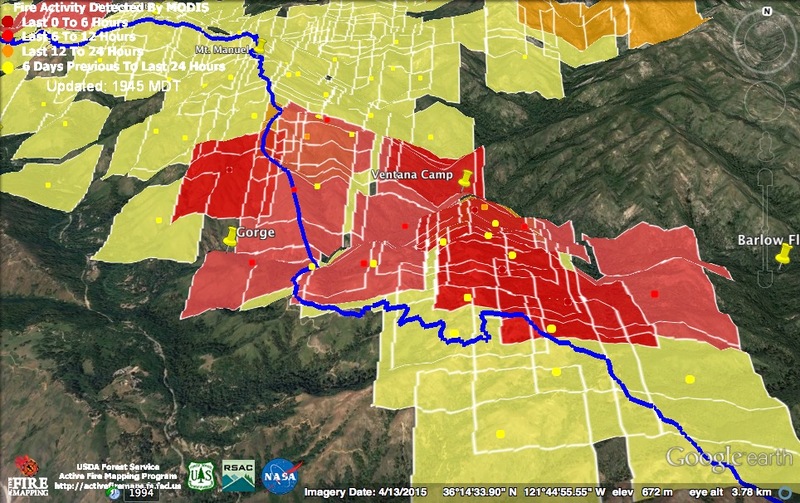 This morning’s infrared map, based on data from about 8:00 pm last night, does indicate fire beginning to cross the river near Hiding Camp. 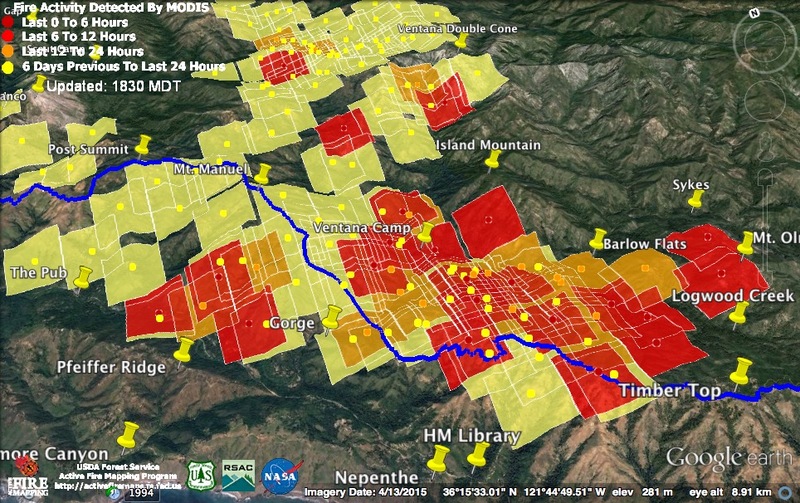 Later MODIS satellite passes did not find any sign of fire making an upslope run toward Miller Mountain or Pine Valley. It would be quite surprising to hear of fire crews actually attempting direct suppression of fire in this area. There has been no effort, so far, to prevent the fire from burning across the Wilderness toward the traditional containment lines over Chew’s Ridge, through Arroyo Seco, etc. The containment date is only a rough guess. If the weather gets hotter and drier the fire will burn to the containment lines faster and be contained sooner (although with greater risk of breaching lines and endangering structures). If the weather remains damp, containment will take longer (with less risk of breached lines). Thank you so much for your detailed information. How many acres do one of those squares represent? 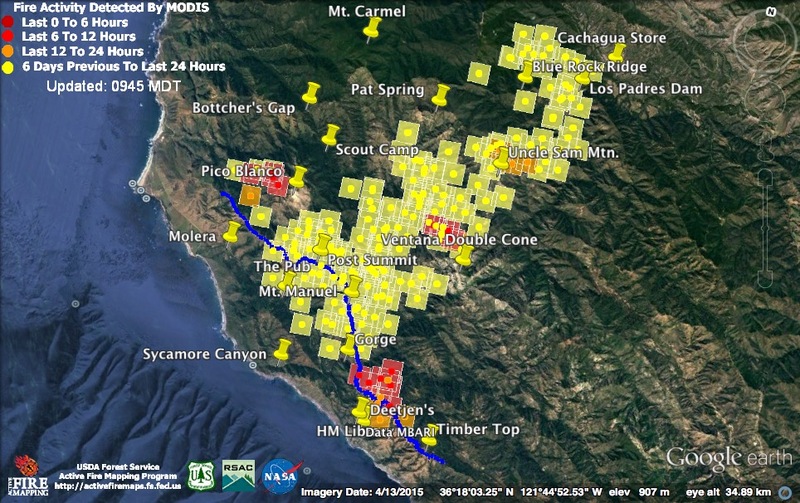 So basically the soberanes fire must burn the footprint that cal fire left?